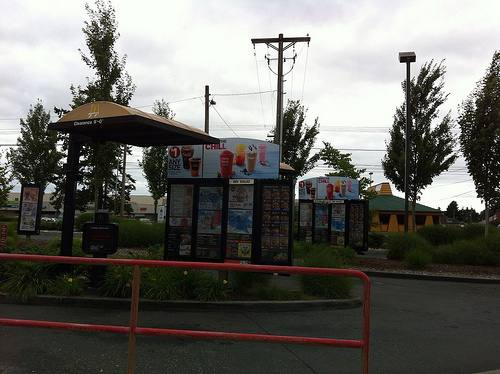 The McDonald’s at 7217 Pacific Avenue, Tacoma, WA 98408 has a duel entrance for their drive through. I assume that it helps the traffic flow and allows for even more customers. 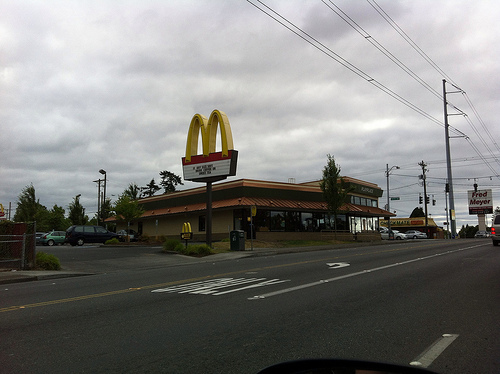 This location was the site of Tacoma’s second McDonald’s, built in 1963 and remodeled in 1977. I remember in 2005 they demolished the building and built the current structure which is larger, has more features and has the before mentioned double drive through. This entry was posted in Restaurants, Tacoma, Take Out, WA State - Pierce County and tagged Avenue, drive through, drive thru, fast, food, McDonalds, Pacific, restaurant on July 30, 2012 by admin.